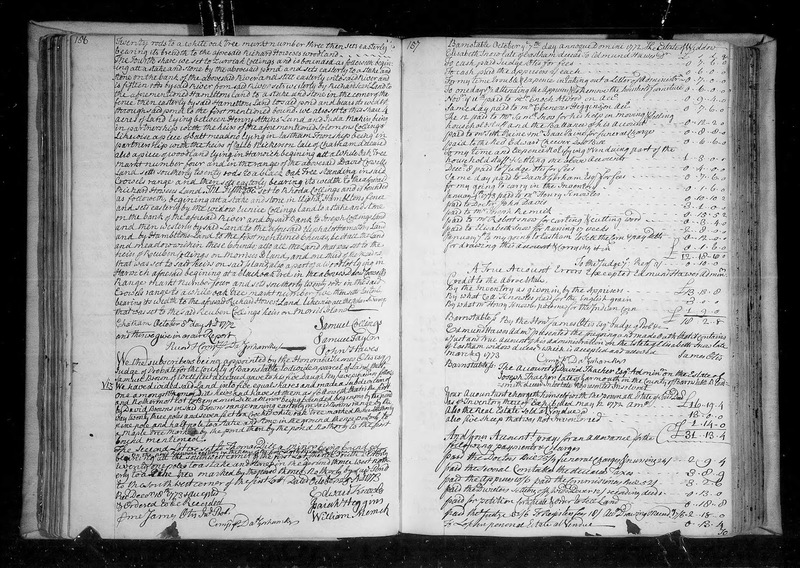 Genea-Musings: Amanuensis Monday - 1773 Division of Land in Court Records for Estate of Samuel Brown (1686-1749) of Eastham, Mass. Amanuensis Monday - 1773 Division of Land in Court Records for Estate of Samuel Brown (1686-1749) of Eastham, Mass. "Massachusetts, Wills and Probate Records, 1635-1991," indexed database with digital images, Ancestry.com (http://www.ancestry.com : accessed 6 December 2016), Barnstable County > Probate Records, Vol. 17, 1768-1775, page 156 (image 87 of 392), division of land of Samuel Brown, 1773. Samuel Brown (1686-1749) of Eastham (apparently in the part that became Wellfleet) bequeathed real and personal property to his five daughters - see Amanuensis Monday - 1748 Will and Court Records for Estate of Samuel Brown (1686-1749) of Eastham, Mass. Samuel Brown's wife, Ruth (Young) Brown (1688-1768) died in 1768, and the land that she was given for her life estate in the will of Samuel Brown needed to be distributed. This document provides a description of one fifth of the distribution - to the children of daughter Mehitable (Brown) Dill (1714-1758), wife of Thomas Dill (1708-1761) of Eastham. Benjamin Dill (1763-????) is the son of Samuel Dill (1736-1766), son of Thomas and Mehitable (Brown) Dill, and great-grandson of Samuel and Ruth (Young) Brown. He was a minor at the time of this distribution. David Brown is mentioned in his portion of the distribution - David Brown (1726-????) is a son of Samuel and Ruth (Young) Brown. Thomas Dill (1755-1839) is the minor son of Thomas and Mehitable (Brown) Dill at the time of this distribution. He was probably their youngest child, and a grandson of Samuel and Ruth (Young) Brown. There is no mention of the division of the land to the other four daughters of Samuel and Ruth (Young) Brown - Abigail, Ruth, Marcy and Mary. Perhaps there is another record - the land records for Barnstable County, Massachusetts were lost to a fire in 1827. Benjamin Dill's land was described as a rectangle, 23 poles, 7 feet east-west, and 9.5 poles north-south (about 387 feet east-west, 157 feet north-south, assuming one pole = 16.5 feet). Thomas Dill's land was described as a rough trapezoid, 23 poles 7 feet east west, with a 21 pole leg to the southwest from the northeast corner of the land, then to the pond, and up to the starting point. The acreage was about the same for the two parcels. I tried to find the location of this land in Wellfleet (the northern part of Eastham before 1766 or so). There are a number of ponds near the boundary line between Eastham and Wellfleet, but none are very large. I recall that I had identified Thomas Dill's land as being in the Mass Audubon's Wellfleet Bay Wildlife Sanctuary (on the west side of Wellfleet near Massachusetts Bay) from records I found in the Eastham library back in 1994. The map on the sanctuary site shows Silver Spring Pond and Goose Pond near the sanctuary center, but a Google Maps satellite view doesn't match the sanctuary map site for some reason. It may be that Goose Pond is the pond to the south of the sanctuary, and would have been west of the land divided to the two young Dill men. Thomas Dill (1755-1839) is my 4th great-grandfather, Thomas and Mehitable (Brown) Dill are my 5th great-grandparents, and Samuel and Ruth (Young) Brown are my 6th great-grandparents.